Taken in Michigan's Eastern Upper Peninsula this morning at the peninsula tip 1/2 mile down the beach from our home - on Lake Huron. Its a different world in the Upper Peninsula at this time of year, compared to the Lower Peninsula. A very moody start to the new season, Paul. Well worth a click for the full effect, I like this a lot! Sorry - ;.) But it is very dramatic and certainly conveys the feel of bitter cold. I really like the upswept clouds against the cold hard watery horizon. Lots of interest to move the eye around the frame. You're really doing great things with ice, Paul. An excellent mood shot with those clouds rolling in. 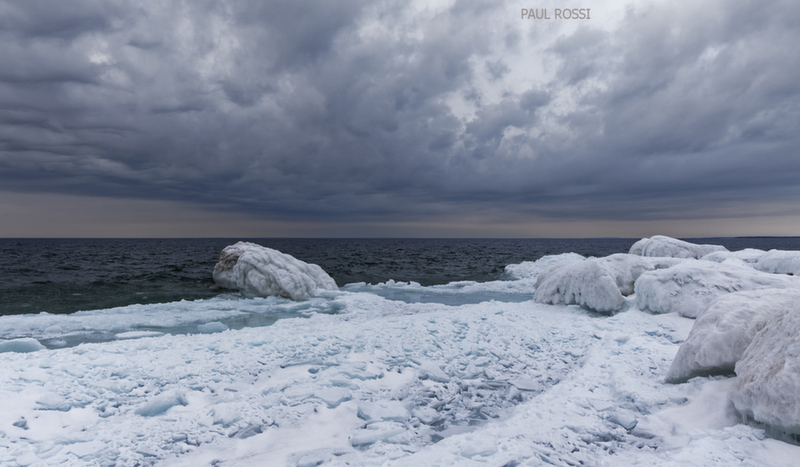 The ice formations are really interesting- I see a giant toad or frog looking into the chilly water! . I see the toad. Totally missed it. Incoming cloud front looks great.